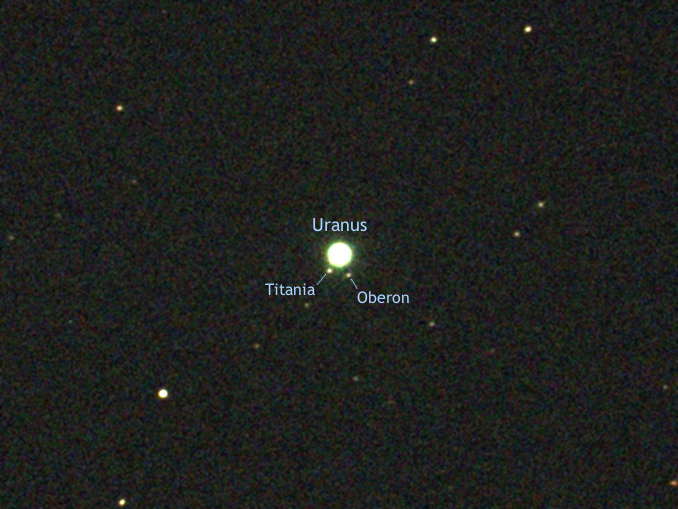 A portrait of planet Uranus and two of its large moons, Titania and Oberon, on 17 September 2018 at 23:10 UT captured using a Celestron 8-inch EdgeHD at f/4.3 with a Starlight Xpress Ultrastar C camera. Currently glowing at magnitude +5.7, Uranus in southwestern Aries is barely a naked-eye object under moonless skies free from light pollution. Titania and Oberon are magnitudes +13.9 and +14.1, respectively, viable visual targets for 10-inch telescopes and larger when well placed. Image credit: Ade Ashford. Now that the season of mists and mellow fruitfulness is upon us in the Northern Hemisphere, observers in temperate latitudes such as the British Isles can celebrate the return of dark skies at a sociable hour by hunting down two gas giants in the outer solar system. Planets Uranus and Neptune presently reside in Aries and Aquarius, respectively, separated by just 47 degrees or little more than twice the span of an outstretched hand at arm’s length. To begin your trek to these denizens of the deep solar system you need to equip yourself with a pair of 8×40, 7×50 or 10×50 binoculars – though just about any low to medium power model will do. As for a location, try to find an observing spot far removed from light pollution that offers an unobstructed view of the southern sky. To see both Uranus and Neptune at their best currently entails viewing around local midnight too. Next, familiarise yourself with the wide-field finder chart below, or download a scalable PDF version of it by clicking here. This wide-field view high in the southern sky of early autumn around local midnight is 80 degrees wide, or roughly four spans of an outstretched hand at arm’s length. 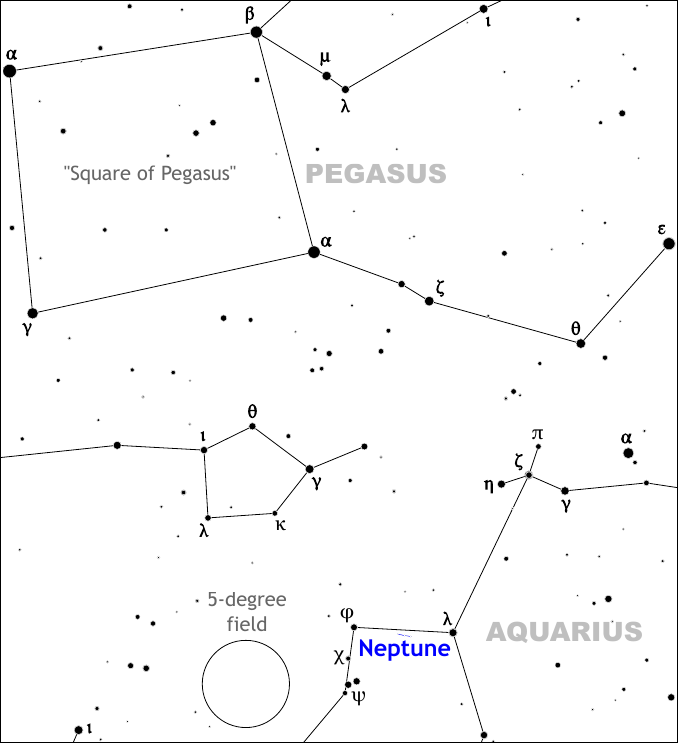 A prominent asterism to get your bearings is the so-called “Square of Pegasus” whose diagonals are roughly the span of an outstretched hand. Two circles show five-degree fields, the amount of sky encompassed by typical 10×50 binoculars. Stars to magnitude +6 are shown, slightly fainter than Uranus. 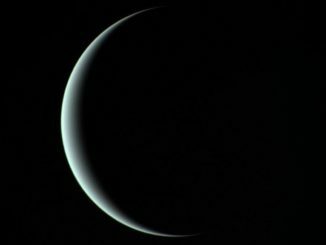 The accompanying article describes how to star-hop to both Uranus and Neptune. Click on the illustration for a scalable PDF version suitable for printing. AN graphic by Ade Ashford. This extract of the wide-field chart above focuses on the constellation of Aries as a reference point. The five-degree-wide asterism formed by α, β and γ Arietis is easily encompassed by 7×50 binoculars. Click on the illustration for a detailed PDF finder chart centred on Uranus suitable for printing. AN graphic by Ade Ashford. I would suggest locating the prominent three-star asterism of Aries as your starting point. To do this, draw an imaginary 25-degree line – slightly larger than the span of an outstretched hand at arm’s length – perpendicular to the Square of Pegasus‘ eastern (left) side. Alpha (α) Arietis, commonly known as Hamal, is a second-magnitude star similar in brightness to those forming the Square of Pegasus. 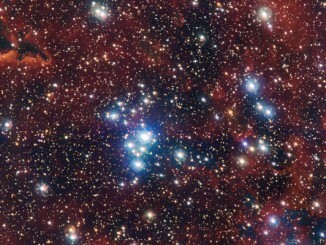 Hamal is the brightest star in its region of the sky, so it’s hard to mistake. With Hamal in your binocular sights, work your way along beta (β) to gamma (γ) Arietis – users of 7 or 8× binoculars can encompass α, β and γ Arietis in the same field of view. Next, you need to take the 6½-degree leap southwest from γ Arietis across the constellation border to magnitude +3.6 star eta (η) Piscium. From eta (η) Piscium, head south 3½ degrees to magnitude +5.5 pi (π) Piscium, then a further 3½ degrees south to magnitude +4.3 omicron (ο) Piscium. Wide-angle 7× binoculars will permit you to see η, π and ο Piscium in the same field of view. 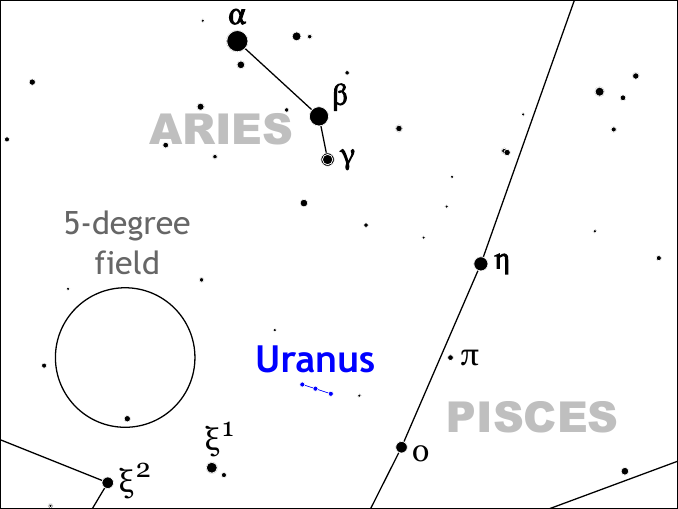 Once you are confident that you have omicron (ο) Piscium in your sights, Uranus is located slightly less than 4 degrees to the star’s northeast (upper left). At this point you may wish to switch scale to a detailed PDF finder chart obtained by clicking here that shows stars to the typical binocular limit of magnitude +9. Now that you’ve located Uranus using binoculars, can you see it with the unaided eye? Currently glowing at magnitude +5.7, the planet is not a difficult naked-eye object under moonless skies free from light pollution if you know exactly where to look and your night vision is good. 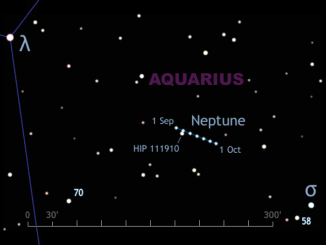 Uranus reaches opposition on 24 October. If you can see it without optical aid, congratulate yourself on spotting a world four times the size of Earth some 19 astronomical units, or 2.8 billion kilometres, distant! 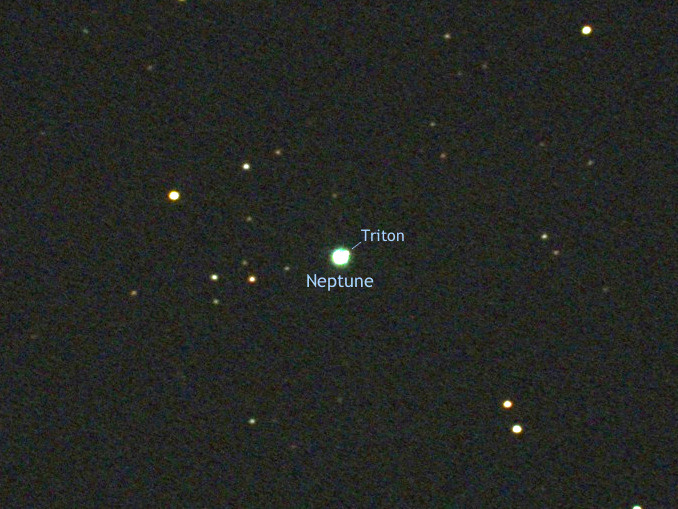 This image of outermost planet Neptune and its largest moon Triton was captured with a Celestron 8-inch EdgeHD at f/4.3 and a Starlight Xpress Ultrastar C camera on 17 September 2018 at 23:05 UT. Neptune currently lies in Aquarius. The outermost planet shines at magnitude +7.8, making it a viable binocular target, but to see Triton (magnitude +13.5) you need an 8-inch or larger ‘scope. Image credit: Ade Ashford. Having found Uranus, are you ready to up the ante by locating the farthest known planet in our solar system? As before, start your search at the Square of Pegasus currently high in the southern sky at midnight. Locate alpha (α) Pegasi, otherwise known as Markab, in the southwest (lower right) of the Square. From magnitude +2.5 Markab, it’s a 7-degree (or a 7× binocular field of view) jump to the lower right to find magnitude +3.4 star zeta (ζ) Pegasi. Next, follow this line for a further 9 degrees until you reach a similarly bright star known as theta (θ) Pegasi. Once you have θ Pegasi in sight, head south by 6½ degrees across the constellation border to third-magnitude star alpha (α) Aquarii, better known as Sadalmelik. Next, head east (left) by slightly less than an 8× binocular field of view (or 5¾ degrees to be exact) to the magnitude +3.6 double-star zeta (ζ) Aquarii. This last star is surrounded by π, η and γ Aquarii that form a conspicuous naked eye and binocular asterism commonly known as the Water Jar of Aquarius. From ζ Aquarii, head 9½ degrees (almost two 10× binocular fields of view) to the southeast (lower left) until you reach magnitude +3.7 star lambda (λ) Aquarii and, just 5½ degrees to the left of the latter, magnitude +4.2 phi (φ) Aquarii. Congratulations, you’ve arrived at the field containing Neptune! Once you have located λ and φ Aquarii it’s time for a change of scale. 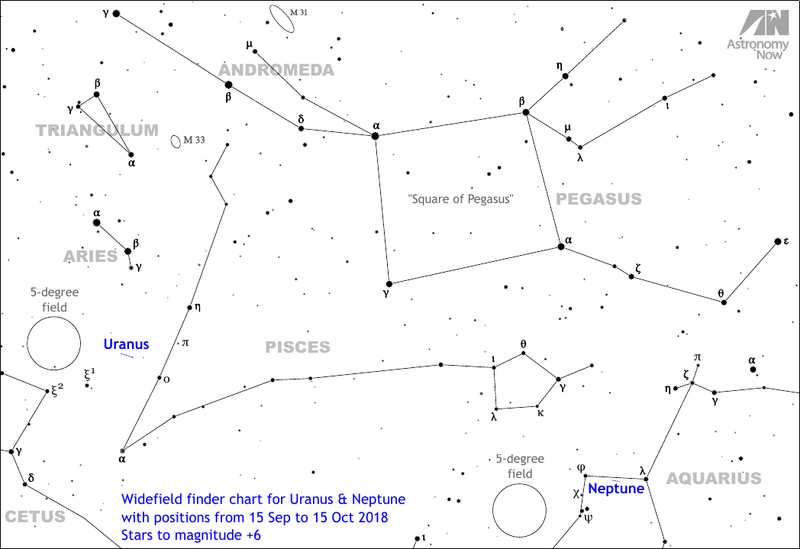 Click here for a detailed PDF finder chart that shows magnitude +7.8 Neptune and the background stars down to magnitude +9 to aid binocular location. Once you are confident that you have indeed found Neptune – remember that its retrograde motion against the stars of Aquarius will confirm it over subsequent weeks – take time to contemplate that this gas giant is almost four times the diameter of Earth (hence similar in size to Uranus) and currently lies 29 astronomical units, or 4&frac13; billion kilometres, distant. If you want a quick way to locate Neptune (other than using a computerised GoTo telescope mount), the 11-day-old waxing gibbous Moon lies 3½ degrees below Neptune in the southern sky at 10pm BST on Saturday, 20 October. Hence the Moon and outermost planet fit within the same field of view of typical binoculars this night.